■EXCITING VISUAL SF SHOOTING ! Jack into cyberspace on this enjoyable cyberpunk shooting game from ALFA SYSTEM. 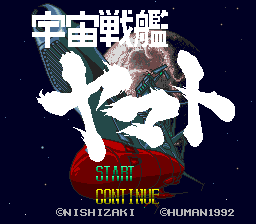 SPACE BATTLESHIP YAMATO for the NEC PC-ENGINE is a simulation game based on the cult classic TV animation series of the same name created by the legendary illustrator「LEIJI MATSUMOTO」.